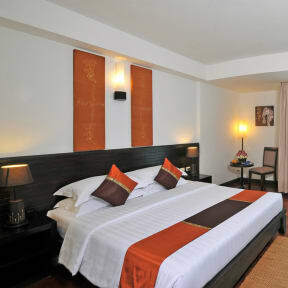 Experience all that Siem Reap has to offer in our stylish 4 star International hotel. 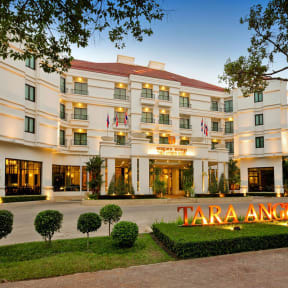 The Tara Angkor Hotel is an ideal base to explore Siem Reap and the magnificent temples steeped in legend and history. Tara Angkor is conveniently located on the road to Angkor only 5km from the entrance, 15 minutes from the airport and a short ride to the centre of town. The Tara Angkor with 206 rooms is also equipped with modern amenities and is elegantly furnished to make your stay luxurious and enjoyable. With exceptionally warm hospitality and traditional Cambodian sincerity and kindness your stay will be something not to be forgotten. Our stylish 4 star property has cemented its status as one of the jewels in Siem Reaps accommodation sector. Our facilities include 206 magnificent rooms and suites, Two Restaurants, a Lobby Bar, and a Swimming Pool with Jacuzzi, Fitness and a Sauna. Further to this, we provide additional services and facilities designed to ensure your stay is both pleasurable and memorable. * Free internet (WiFi) in Lobby area, restaurants and all guests room.